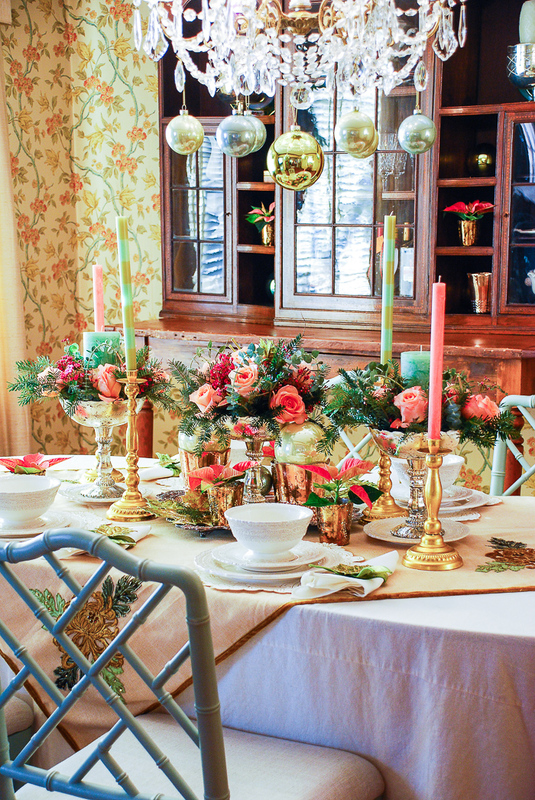 Embrace the unexpected this holiday season with a whimsical-glam Christmas table bedecked with mixed metals, pink and green hues, Arté Italica dinnerware, poinsettia, and fanciful ornaments. 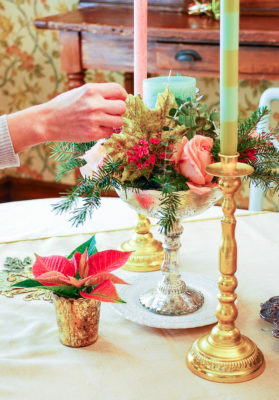 Candlelight flickers over a carefully laid table. while presents peak from underneath. and children bask with happy abandon. Merry Christmas y’all! 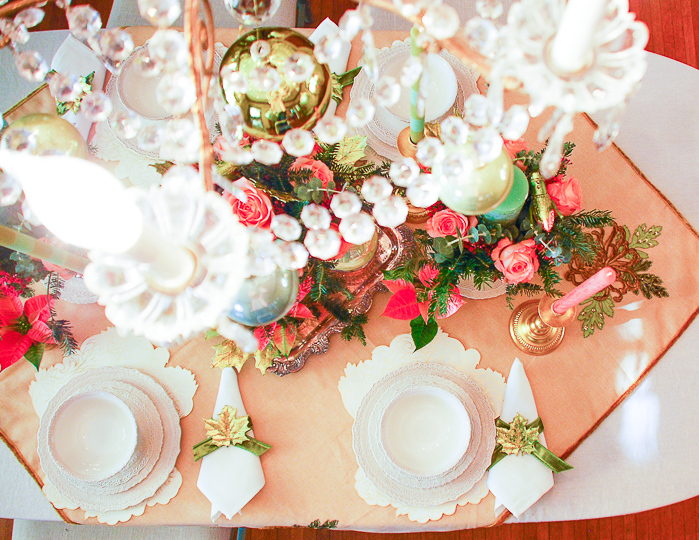 Today, I am so excited to share this whimsical-glam Christmas table designed by the ladies of Hoskins in the Flat. 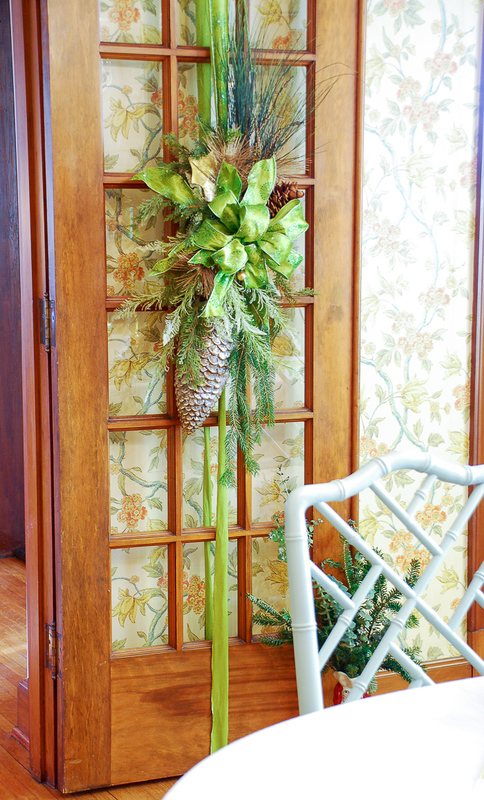 This talented sister duo, Mollie and Jenky, own a charming floral design, decor, and gift shop in my little town of Clinton, T.N. 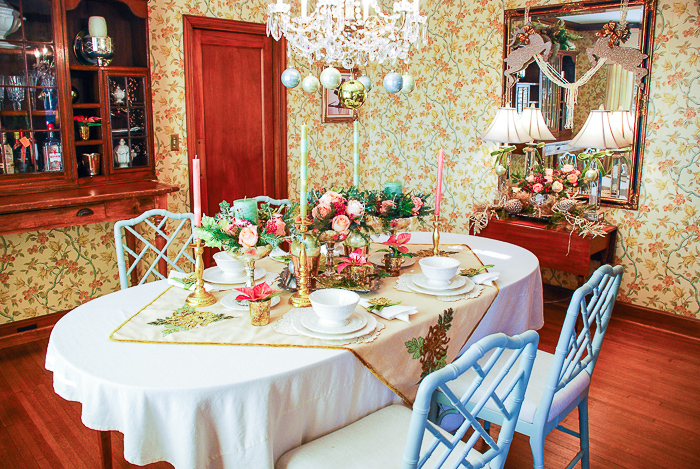 We had been looking for a project to collaborate on and a Christmas tablescape seemed like the perfect opportunity! Mollie graciously volunteered her historic home for the canvas. 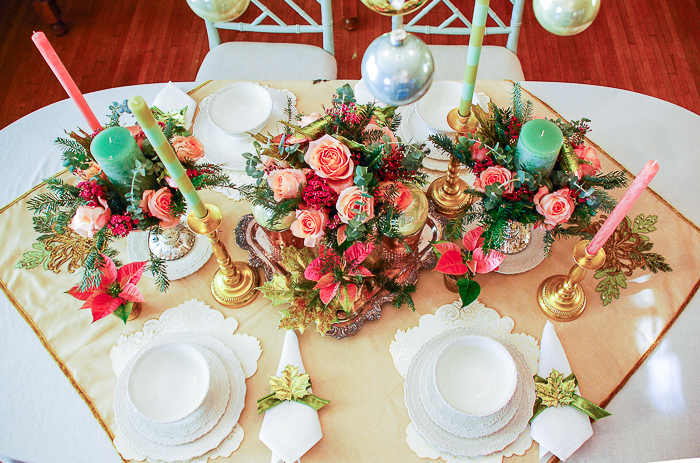 The tablescape they created is simply gorgeous. 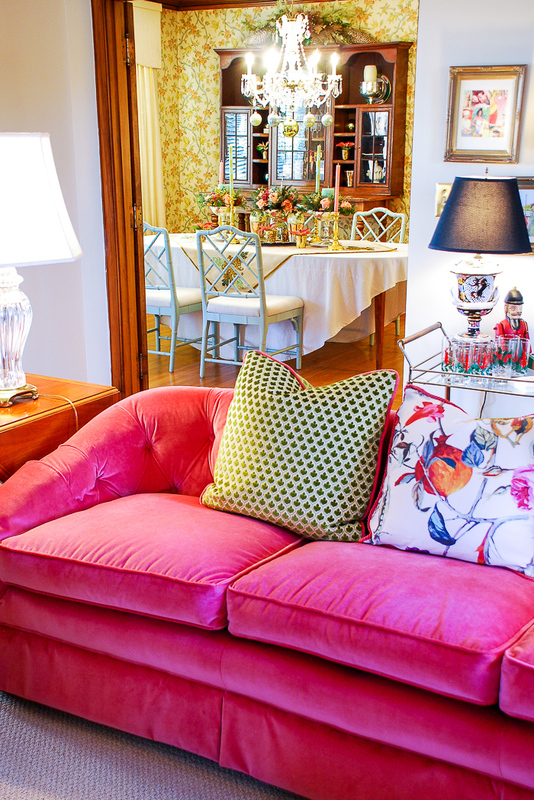 It is whimsical and playful, elegant and chic, original and yet classic! 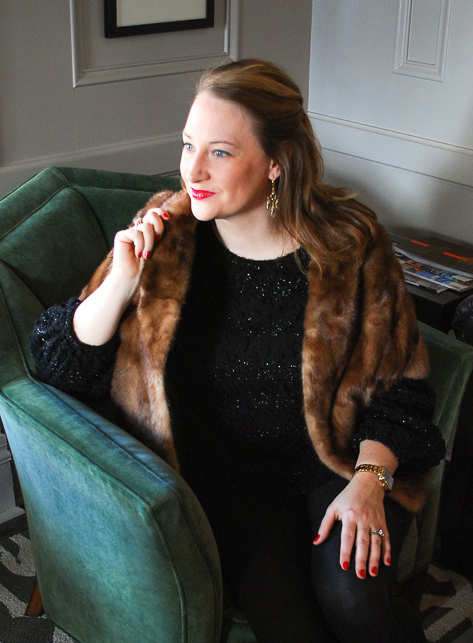 I’m calling the look whimsical-glam. 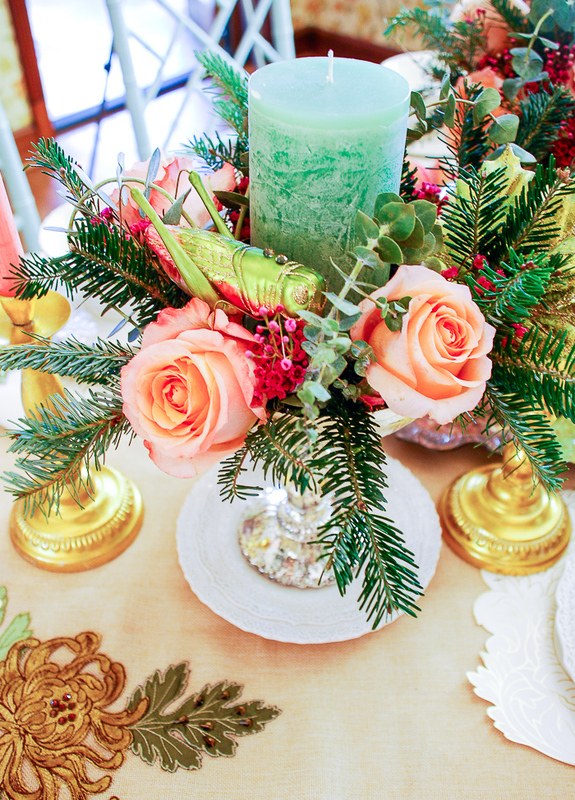 I know, I’m gushing, but this table just hits all my design buttons from the bold color palette of pink, green and pale blue to the mixed arrangements of roses, eucalyptus, evergreen, and poinsettia! Gorgeous! 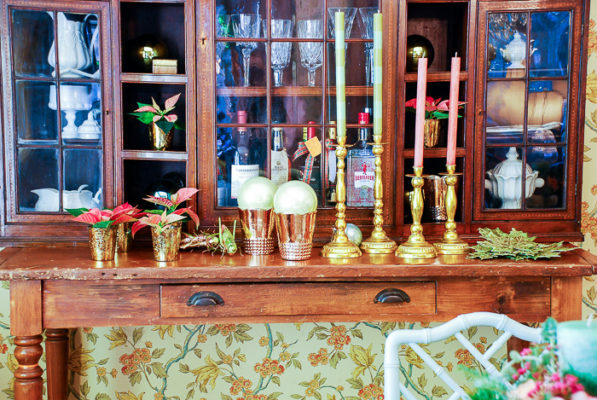 Don’t you just love the unexpected colors, beautiful details, mix-up of metals, and touches of whimsy? 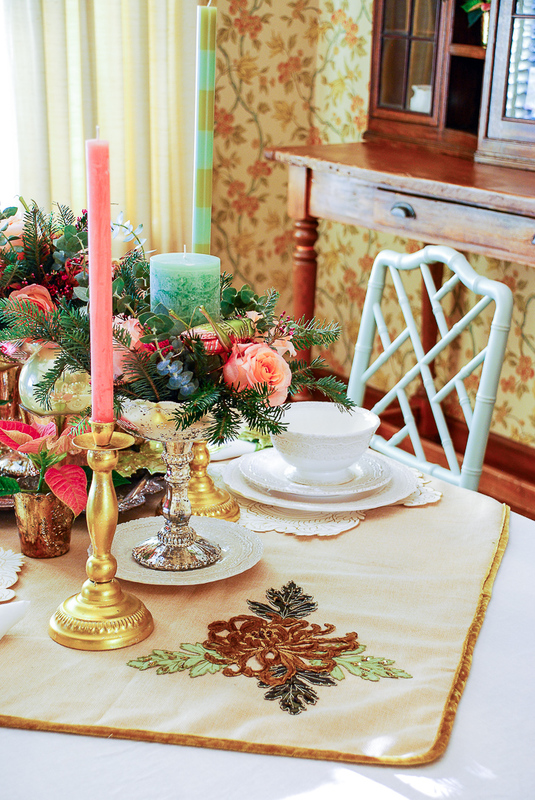 This whimsical-glam Christmas table is all about layers and mixing unexpected elements. Mollie and Jenky started with a simple white linen and then toped it with a beautifully detailed, but almost neutral square runner. 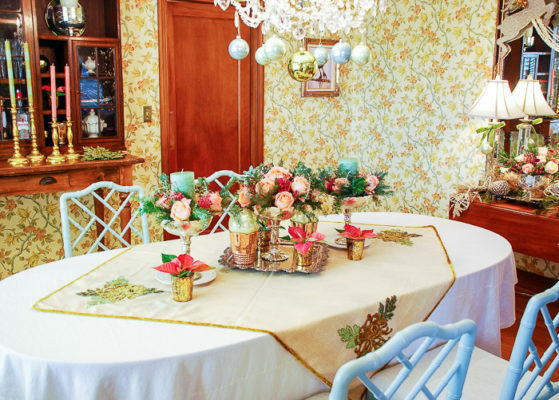 This background allows the floral centerpieces to really pop. Next came a base for the centerpieces with a silver tray and white dishes out of the same dinnerware as the place settings. 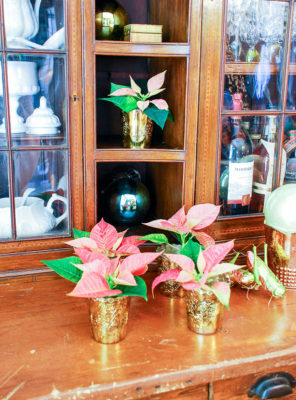 The florals were added and then extra accents with the mini poinsettia in julep vases and pearlized Christmas ball ornaments. 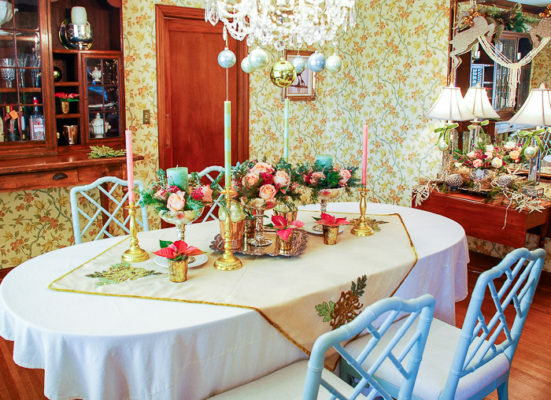 The place settings contribute to the texture of the tablescape, while being neutral in color. 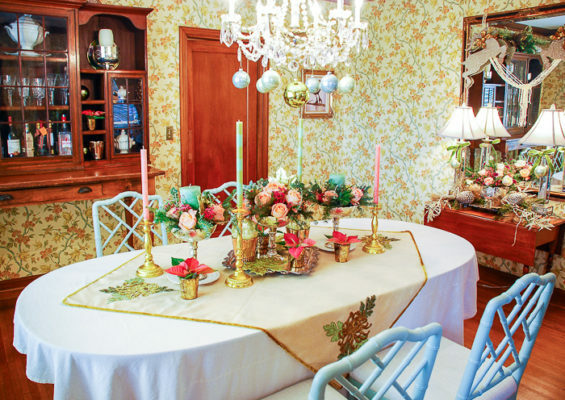 The placemats are made from paper. How neat is that?! 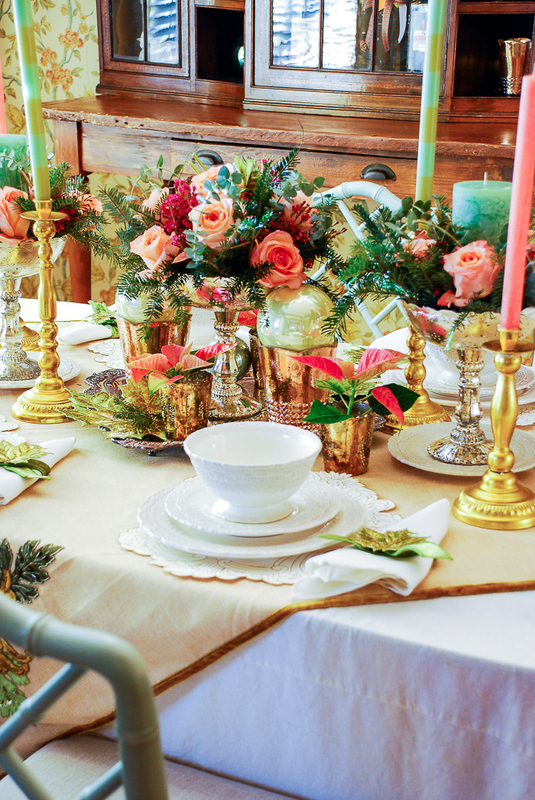 Simple white napkins adorned with green velvet ribbon and a leaf for napkin rings complete the setting. 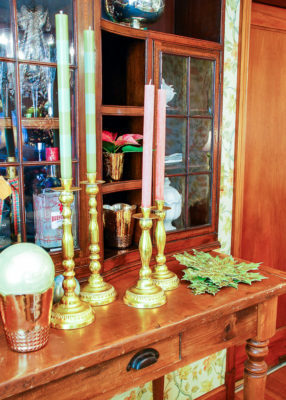 Tall candlesticks with brightly colored candles amp up the glam factor. The inexpensive gold holders add a new metallic into the mix with the mercury glass, silver, and bronze, proving that you can mix metals. 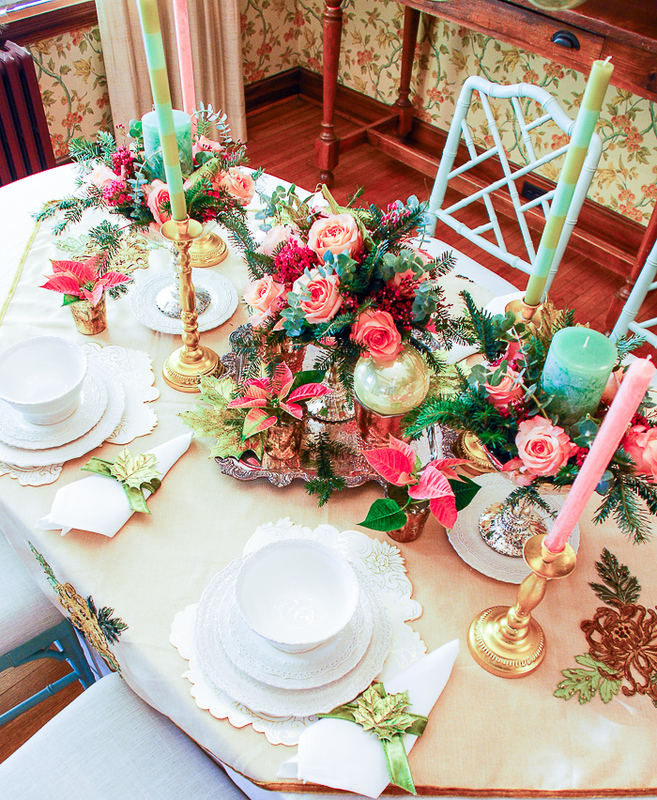 To finish this whimsical-glam table, the ladies added a few more playful accents with more green metallic leaves tucked into the centerpieces and pink and green grasshopper ornaments. These cheeky little fellows wanted to be part of the Christmas magic! 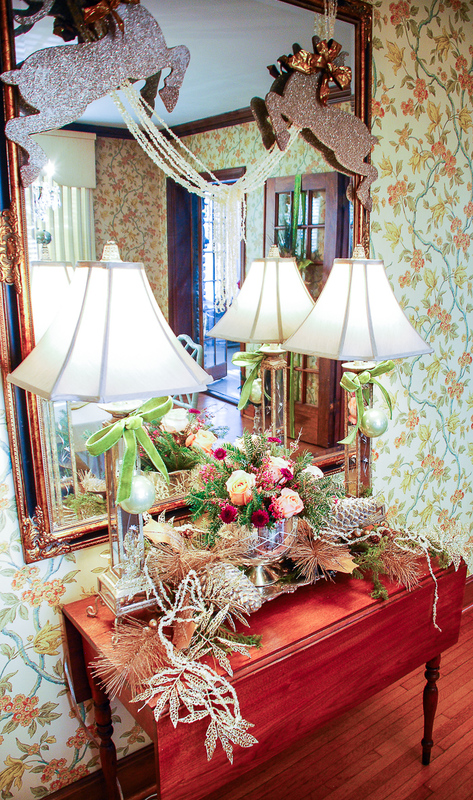 Do you see them peaking out from the two outer floral arrangements? 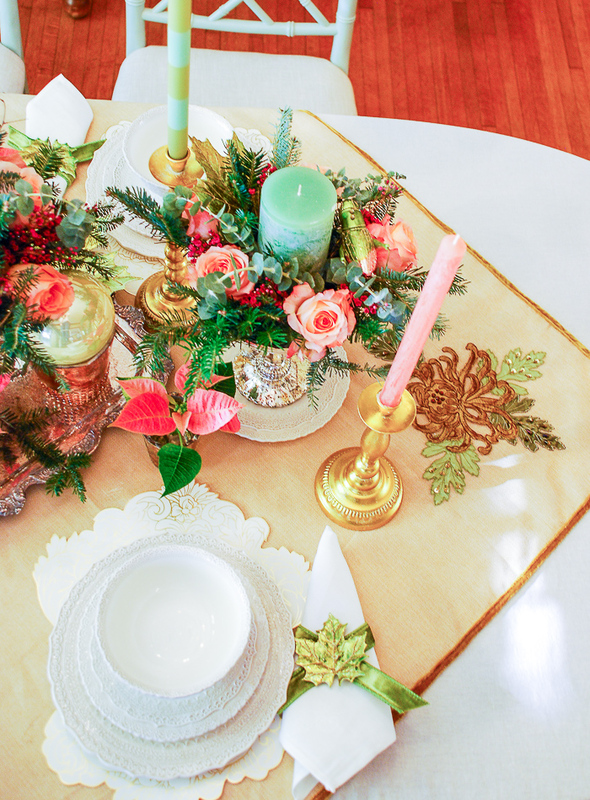 Don’t miss Jenky and Mollie’s tips to create a whimsical-glam Christmas table below! 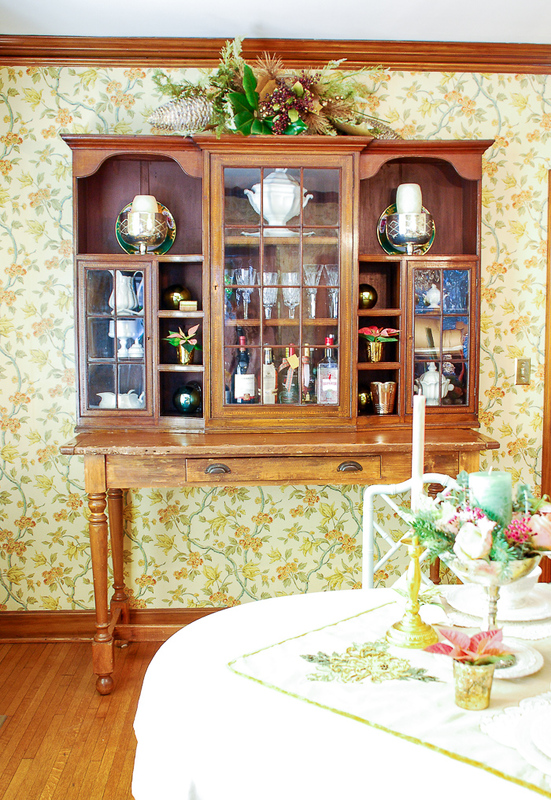 Click through the slideshow above to see how the Christmas table was created! 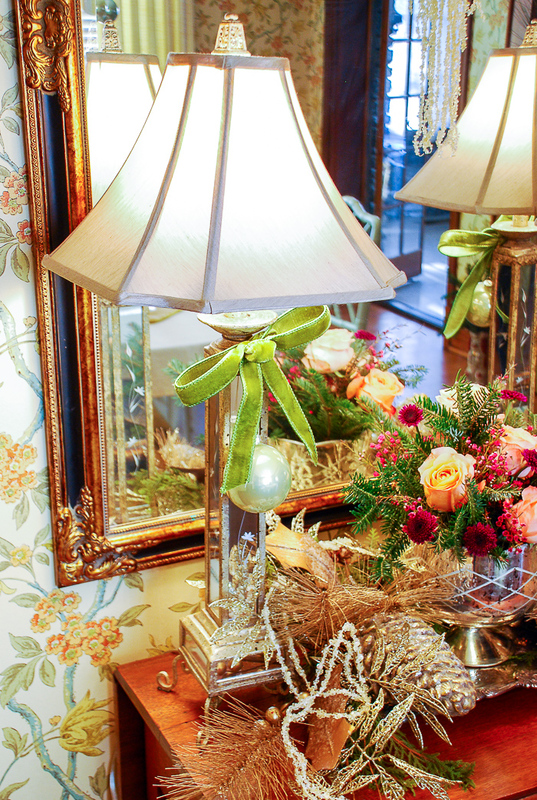 Embrace color and don’t be afraid to stray from classic Christmas color schemes, but do stay true to the character and palette of your home. Use lots of different textures. Mixing metals is a must. When you put several together it really amps up the glam. 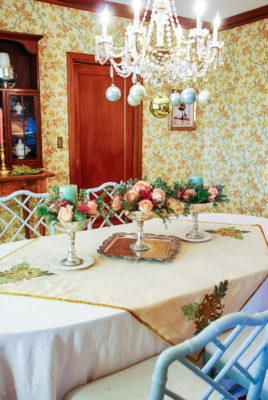 Start your tablescape with a simple fresh flower in a color that coordinates with your decor. Roses are always a classic choice that are easy to pick up at the grocery. 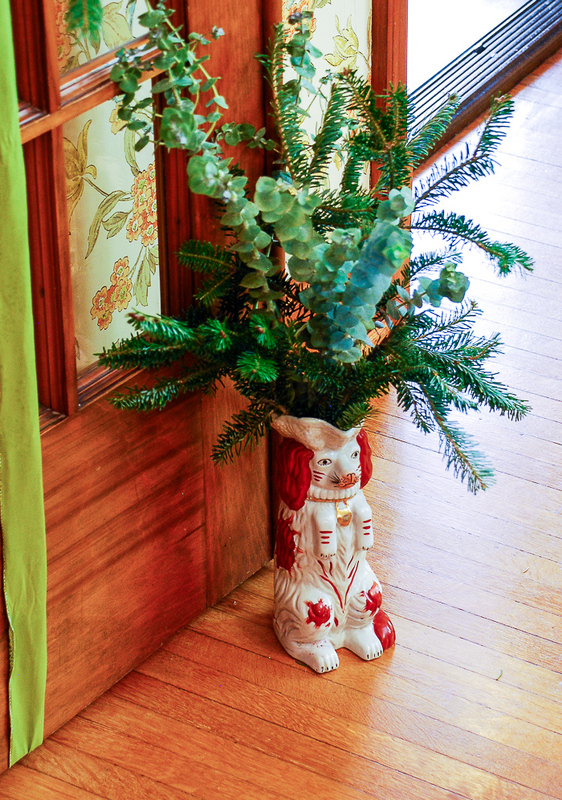 Add a touch of whimsy. Something unexpected that sneaks up on guests. It is a wonderful conversation starter, and fun for the kiddos. Do you love Hoskins in the Flat’s design genius as much as me? 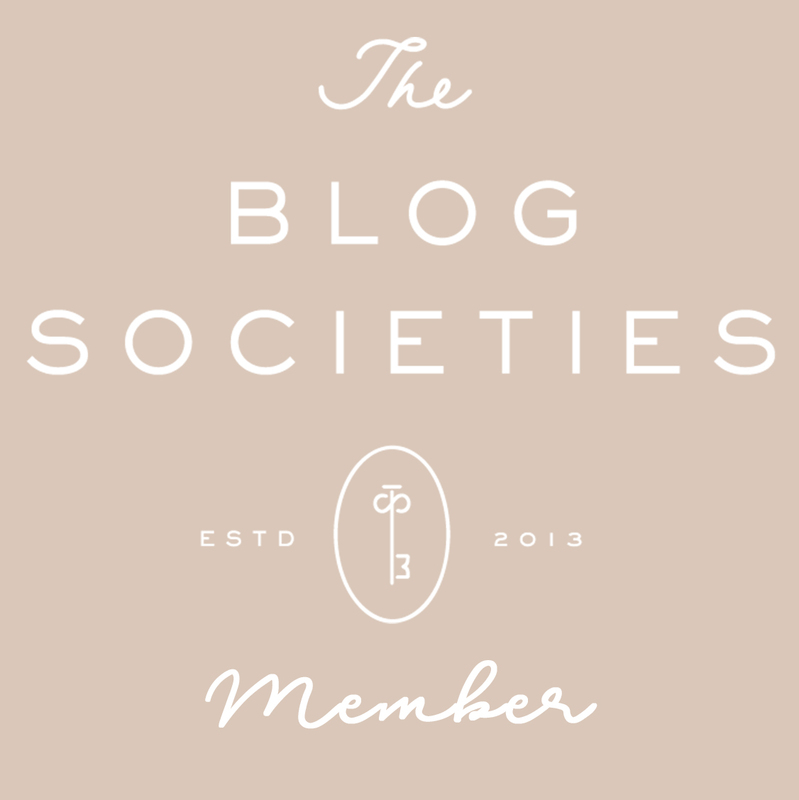 Check out some more of their work here!